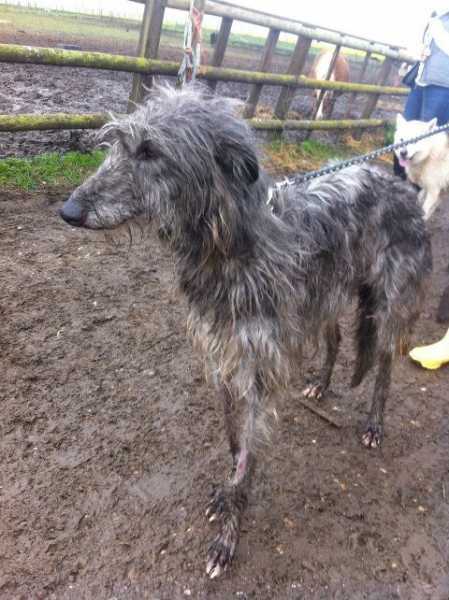 A female Deerhound has been found straying, she's at South East Dog Rescue in Kent. I have no further information on her other than they think she's around 2yrs. There's a picture of her and she looks rather thin and matted! Does anyone on the forum know of any missing dogs in the South East of England? My main concern is trying to locate the owner/breeder before she is rehomed! Last Edit: 6 years 10 months ago by Robb. Very scary - she looks like a thinner version of Clunie (even my 8 year old son said - it's Clunie!). I assume taht she hasn't been chipped? I hope that she finds her owners or breeders soon. Poor girl. I thought it strange Rob that she is not microchipped and the fact that if she was a full Deerhound that she isn't missed by someone. She does look a bit thin and her coat needs a good brush, but apart from that she looks lovely and I hope that she is either rehomed soon or her owners claim her. Someone must be missing her! I understand that she's now got a home lined up. Robb wrote: I understand that she's now got a home lined up.